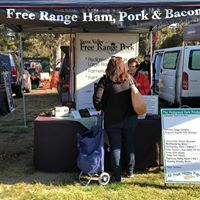 Why not visit us at a Farmers Market near you and try some of our delicious free-range, rare breed pork? Not sure what to buy or want to order in advance? Feel free to view our product listing. AS MARKETS ARE SOMETIMES CANCELLED OR, FOR SOME REASON WE ARE UNABLE TO ATTEND, IT IS ADVISABLE TO CHECK A FEW DAYS BEFORE THAT WE WILL INDEED BE AT THE MARKET THAT YOU INTEND TO GO TO.